Cure your Trigger Finger Today. Effective Treatment, Non Surgery. Call us +65 97731458 to schedule for an appointment. Trigger finger is a painful condition that causes the fingers or thumb to catch or lock when bent. In the thumb its called trigger thumb. A tendon usually glides easily through the tissue that covers it (called a sheath) because of a lubricating membrane surrounding the joint called the synovium. Sometimes a tendon may become inflamed and swollen. When this happens, bending the finger or thumb can pull the inflamed tendon through a narrowed tendon sheath, making it snap or pop. Trigger finger can be caused by a repeated movement or forceful use of the finger or thumb. Rheumatoid arthritis, gout, and diabetes also can cause trigger finger. So can grasping something, such as a power tool, with a firm grip for a long time. Farmers, industrial workers, and musicians often get trigger finger since they repeat finger and thumb movements a lot. Even smokers can get trigger thumb from repeated use of a lighter, for example. Trigger finger is more common in women than men and tends to happen most often in people who are 40 to 60 years old. One of the first symptoms of trigger finger is soreness at the base of the finger or thumb. The most common symptom is a painful clicking or snapping when bending or straightening the finger. This catching sensation tends to get worse after resting the finger or thumb and loosens up with movement. In some cases, the finger or thumb locks in a bent or straight position as the condition gets worse and must be gently straightened with the other hand. 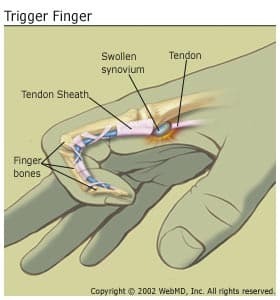 Trigger finger is diagnosed with a physical exam of the hand and fingers. In some cases, the finger may be swollen and there may be a bump over the joint in the palm of the hand. The finger also may be locked in bent position, or it may be stiff and painful. No X-rays or lab tests are used to diagnose trigger finger. The first step is to rest the finger or thumb. Our doctor may put a splint on the hand to keep the joint from moving. If symptoms continue, our doctor may prescribe drugs that fight inflammation. Our doctor may also recommend an injection of anti-inflammatory medicine into the tendon sheath. If the trigger finger does not get better, our doctor may recommend surgery of Trigger Finger Release. Many famous athletes Tiger Woods, tennis star Rafael Nadal, and several others have received PRP for various problems, such as sprained knees and chronic tendon injuries. These types of conditions have typically been treated with medications, physical therapy, or even surgery. Some athletes have credited PRP with their being able to return more quickly to competition. How does Platelet Rich Plasma (PRP) works? Although it is not exactly clear how PRP works, laboratory studies have shown that the increased concentration of growth factors in PRP can potentially speed up the healing process. 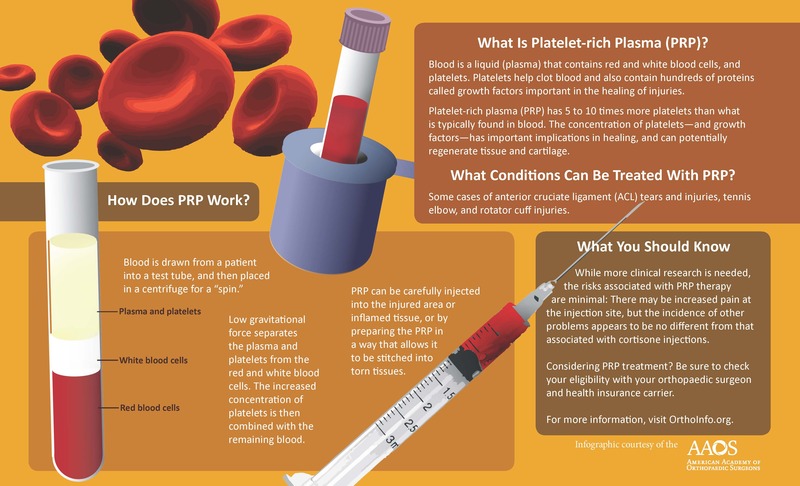 What conditions are treated with Platelet Rich Plasma (PRP)? The use of PRP for other chronic tendon injuries such as chronic Achilles tendonitis or inflammation of the patellar tendon at the knee (jumper’s knee) is promising. However, it is difficult to say at this time that PRP therapy is any more effective than traditional treatment of these problems. More recently, PRP has been used during certain types of surgery to help tissues heal. It was first thought to be beneficial in shoulder surgery to repair torn rotator cuff tendons. However, the results so far show little or no benefit when PRP is used in these types of surgical procedures.Surgery to repair torn knee ligaments, especially the anterior cruciate ligament (ACL) is another area where PRP has been applied. At this time, there appears to be little or no benefit from using PRP in this instance. PRP has been used in a very limited way to speed the healing of broken bones. So far, it has shown no significant benefit.Treatment with platelet-rich plasma holds great promise. Currently, however, the research studies to back up the claims in the media are lacking. Although PRP does appear to be effective in the treatment of chronic tendon injuries about the elbow, the medical community needs more scientific evidence before it can determine whether PRP therapy is truly effective in other conditions.Even though the success of PRP therapy is still questionable, the risks associated with it are minimal: There may be increased pain at the injection site, but the incidence of other problems — infection, tissue damage, nerve injuries — appears to be no different from that associated with cortisone injections. If you are considering treatment with PRP, be sure to check your eligibility with your health insurance carrier. Few insurance plans, including workers’ compensation plans, provide even partial reimbursement. Stop your Hand & Wrist Pain today. Effective Treatment, Non Surgery. Discuss with our Orthopaedic Specialist for the Diagnosis, Treatment and Prognosis of your Hand Pain. Call us +65 97731458 to schedule for an appointment. Hand and Wrist pain can be caused by one or more of a number of different disorders. Lifestyle diseases will become more common as we live longer and lead more active lives. Hand and wrist pain are among these lifestyle diseases. They are usually amenable to simple treatment strategies, provided they are diagnosed early. Why are the hand and wrist special? The hand and wrist are our main point of physical contact with the world. They manipulate objects to aid us in our daily lives. As such, pain that disables our hand and wrist can lead to a marked decrease in our ability to functional at work and play. Which parts of our hand and wrist are commonly affected by pain? A common cause of hand pain that many feel at the base of their fingers, in the palm of the hand, is trigger finger. Trigger finger is a condition where a patient feels pain or discomfort when trying to straighten or bend their finger/thumb. Sometimes the finger may become ‘locked’ or ‘stuck’ when swelling of the tendon sheath occurs. This swelling can be associated with diabetes, rheumatoid arthritis, or even golf. Carpal Tunnel Syndrome can also cause hand pain. There is a tunnel in the wrist called the carpal tunnel. Nine tendons and the median nerve pass through it. When pressure builds up in the tunnel, the nerve gets compressed and is unable to function properly. This may result in numbness, discomfort and pain in the fingers. This condition usually associated with a tingling sensation over the thumb, index and middle fingers, especially at night. Risk factors for carpal tunnel syndrome include age, diabetes and rheumatoid arthritis. Another common cause of finger pain is trauma. In this instance, the injured tissue could be the tendon, ligament, bone, or even a combination. It is thus imperative that all injured tissues are adequeately addressed and optimally treated. Wrist pain is more complex. It is usually divided into conditions that cause pain on the radial side of the wrist, i.e. nearer the thumb, and those that cause pain on the ulnar side of the wrist, i.e nearer the little finger. Radial-sided wrist pain can be caused by an injury to an important ligament called the scapholunate ligament. 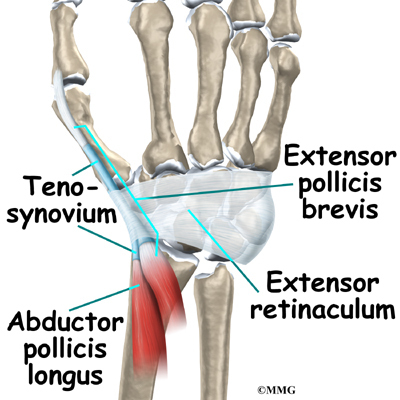 This ligament helps two important bones of the wrist joint, namely the scaphoid and the lunate, move in unison. When this ligament is injured, these bones no longer move in tandem, thus leading to pain. This would be aggravated by motion and lead to accelerated arthritis in the wrist, which in turn, manifests as stiffness and poor grip strength. In addition, woman who are in the perinatal period also belong to a unique population who can suffer from a tendon condition called Dequervain’s Tenosynovitis. It is a condition in which one feels pain over the wrist joint near the base of the thumb. It begins as an aching sensation initially, and progresses to a point when any movement of the wrist or thumb produces sharp pain in the affected area. That area of the wrist may become swollen at times. Often, nursing mothers affected for the period that they are caring for their newborns. This is due to poor ergonomics, or by the hormonal changes that affect their tissues. Ulnar sided wrist pain is common in a patient who has sustained a twisting injury or a fall on an outstretched hand. This is usually due to a tear of a ligamentous structure called the “triangular fibrocartiligeneous complex”, which stabilises the wrist joint. Patients with this problem can experience pain in their wrists associated with instability and diminished grip strength. Like the radial side of the wrist, tendons on the side of the wrist can also suffer from inflammation which causes pain, and is usually caused by overuse. How do we diagnose such conditions? Firstly, we take a history from our patients. This includes finding out the circumtance surrounding their complaint, as well as the nature of the complaint. This can help us ascertain the tissue that is the main “pain generator”. Secondly, a thorough clinical examination of the hand and wrist helps us confirm or rule out the possible reasons for our patient’s pain. X-ray, fluoroscopy (real time X-rays), computed tomograpgy (CT) scans and magnetic resonance imaging (MRI) scans are all important diagnostic tools to help Hand Surgeons confirm diagnoses. Arthroscopy of the wrist is currently the gold standard diagnostic procedure of choice when the internal architecture of the joint, such as the cartilage, needs to be assessed. Therapeutic key-hole surgery can also be performed with the aid of this tool. CARPAL TUNNEL SYNDROME – Carpal tunnel syndrome occurs when the median nerve which runs from the forearm into the hand becomes pressed or squeezed at the wrist. DE QUERVAIN’S STENOSING TENOSYNOVITIS – is a condition brought by irritation or inflammation of the wrist tendons at the base of the thumb. MALLET FINGER – Mallet finger occurs when the outermost joint of the finger is injured. With mallet finger, the tendon on the back of the finger is separated from the muscles it connects. TRIGGER FINGER – Trigger finger is a common disorder of the hand which causes painful snapping or locking of the fingers or thumb. 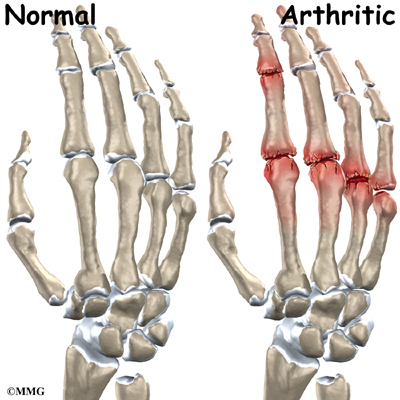 ARTHRITIS – Osteoarthritis of the fingers and thumb is characterized as chronic and often disabling pain and stiffness of one or more joints. HEBERDEN’S NODES – are hard or bony swellings that can develop in the distal interphalangeal joints (DIP) (the joints closest to the end of the fingers and toes). WRIST GANGLION CYST – is a swelling that usually occurs over the back of the hand or wrist. These are benign, fluid-filled capsules.